Gone are the days when kitchen appliances were more useful the larger they were in size. Nowadays, even the tiniest small kitchen appliances can whip up anything from a delightful snack to a scrumptious meal. 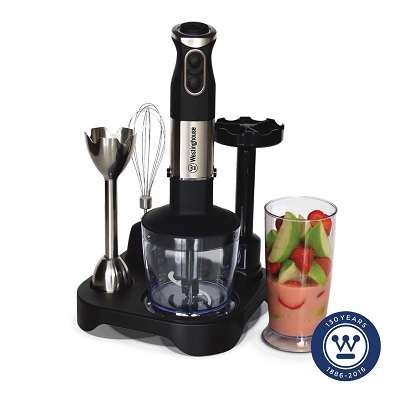 One such appliance is the Westinghouse 1000W Stick Mixer – whilst small in stature, don’t let that fool you, this wizard in the kitchen can chop, blend, whisk and mash a variety of tasty treats. Who can resist such a classic? The key to a great mashed potato, of course, is not only in good quality potatoes, but also in giving it a good mash. Drop first in boiling water to soften, then cool to peel. Cut into chunks so that it will fit right into the beaker.